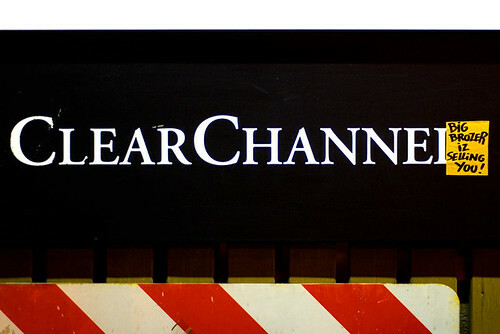 In the last decade Clear Channel Communications Inc. has acquired over 1,200 radio stations, 700,000 billboards and 200 concert venues, making it into a global telecommunications giant. This was impossible under FCC ten years ago, until The 1996 Telecommunications Act lifted limits on the number of radio stations a company can own. But now, it owns complete tours of artists like Madonna and Pearl Jam, and even the advertising space at the train station in the small university town in Belgium where I live. As companies like Clear Channel (and it's competitors, CC is hardly alone in this trend) begin to buy up local broadcasters around the world, the temptation to take advantage of media consolidation seems to be getting hard to ignore. Cutting the air time of groups not interested in their tour-management services is only one of many accusations levied against CC in recent years. What I find a creepy example of something, I don't know exactly what yet, is CC's sponsorship of pro-war demonstrations and Dixie Chicks CD destroying parties, due mostly to their widely syndicated radio personality, Glenn Beck. His "Rally for America" demonstrations were sponsored by local stations but then covered on the radio as if they were news. This is the company that owns the syndication of Rush Limbaugh, so I had to wonder, what does CC have to gain by pushing such a right-wing agenda? 1. Shortly after 9/11, Internet chat rooms and bulletin boards were flooded with claims of radio censorship. Bands like Rage Against the Machine, and anti-war sentiments like John Lennon's "Imagine" were supposedly being banned from radio in America. Turns out this was simply a strong suggestion on the part of Clear Channel headquarters. Claims of government censorship turned out to be false, but with CC owning 60+% of the rock stations in the country, the effect was a large scale removal of anti-war or anti-establishment sentiment from the airwaves. 2. In 1998 Tom Hicks, Vice-Chair of Clear Channel purchased the Texas Rangers. Due largely to their new tax-payer subsidized stadium, the sale made millions of dollars for one of their prominent Texan investors, George W. Bush. 3. 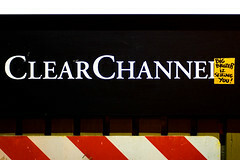 Michael (son of Colin) Powell, the head of the FCC, is considering further deregulation of the telecommunications industry, a step that would allow Clear Channel to further its radio business model into the television industry.